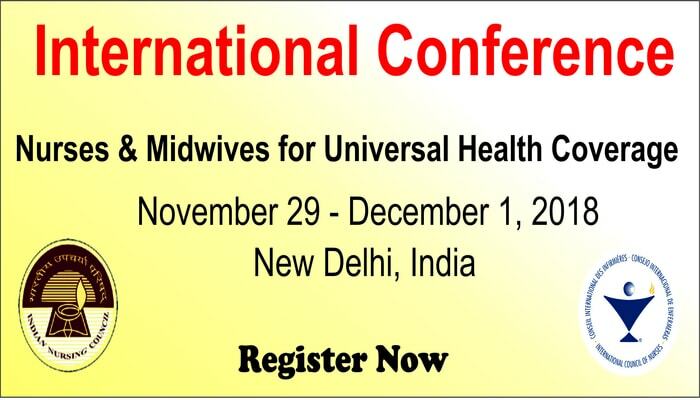 Indian Nursing Council (INC) in partnership with International Council of Nurses (ICN) invites delegates from across the world to attend the International Conference on Nurses and Midwives for Universal Health Coverage from November 29 to December 1, 2018 at New Delhi, India. The conference provides a platform for presentations of best practices, innovations and research results in Universal Health Coverage (UHC) and nurses’ role in achieving it. International Council of Nurses (ICN) is a non-government organization of more than 130 national nurses’ associations representing more than 20 million nurses worldwide. Operated by nurses and leading nurses internationally ICN works to ensure quality of nursing care for all, sound health policies globally and advancement of nursing knowledge.